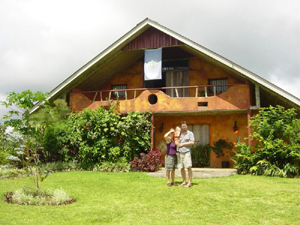 This beautiful hilltop paradise overlooks Lake Arenal, with views stretching both north and south to two of Costa Rica’s most famous volcanoes--Arenal and Tenorio. 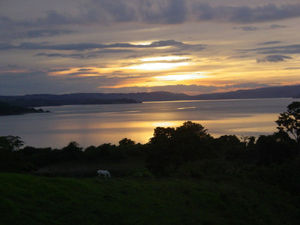 Located in northeast Guanacaste, 7 kilometers outside the sleepy lake town of Arenal and 45 minutes from the bustling towns of Fortuna and Tilaran, this property is both secluded and convenient. 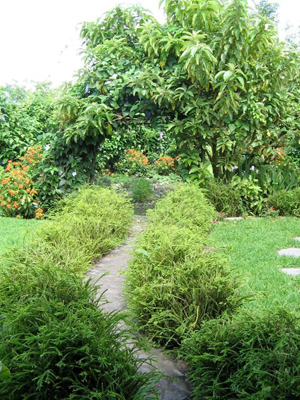 3.75 acres of lush, tropical landscape & organic gardens at an elevation of 2600 feet with an average daytime temperature of 75F. 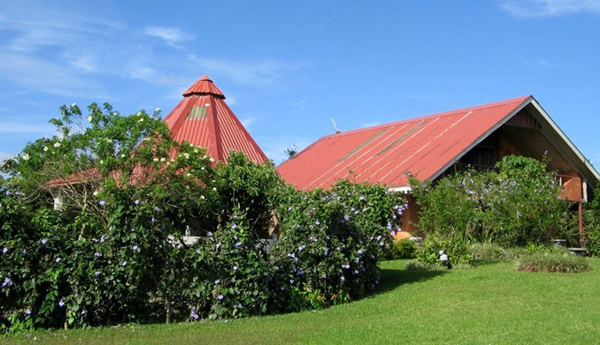 On this wonderful property is a custom-built two-story house full of convenience, comfort, creativity, and artistry. Beside it is a 40 by 20 rancho with outdoor kitchen and bar. 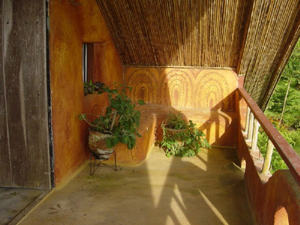 Of sophisticated straw-bale construction (see http://www.strawbale.com), the home has the kitchen, living and dining areas, bathroom and a bedroom on the first floor, and on the second floor two sleeping areas, a lounge/office, and two decks. There is another private flagstone shower outside the house. Additional featurees include a wooden kids play structure with swings, climbing wall, platform, and fire pole, tool and laundry bodegas attached to the main house, and an outdoor workshop and materials storage area. Designed to provide sustainable living, the home's straw-bale construction provides great insulation and consistent interior temperatures. 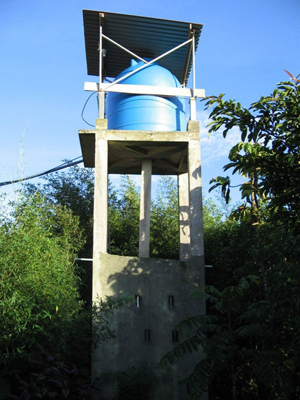 There's on-site private well water, legal access to spring water, and rain water reclamation for gardens is in use. There is excellent solar and wind power potential at this site as well. Don't miss pages a, b, c, d, and e for more photos and information. 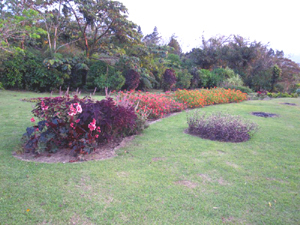 The rancho and home hide behind some of the property's great variety of plants and trees. 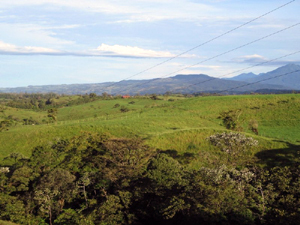 To the north, the dormant Tenorio Volcano with Miravalles Volcano beyond it provide imposing scenery. The changing light varies the beauty of the lake, mountains and sky throughtout the day. The owners before their extraordinary home. 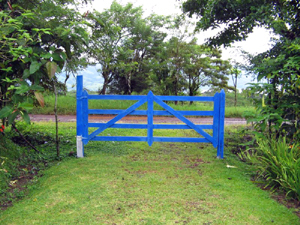 The large property has a modest entrance. 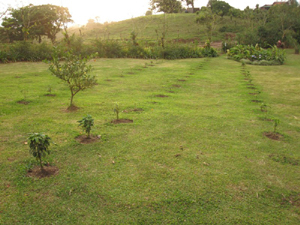 Huge flower beds as well as jungle l.
A newly planted coffee orchard. 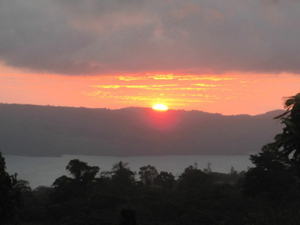 A view toward the north end of Lake Arenal. One of two second-story decks.